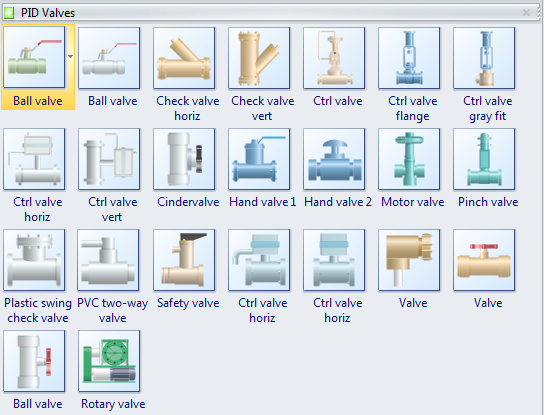 Provide various lifelike valves symbols, including ball valve, check valve, control valve, motor valve, hand valve, and 3D valve. 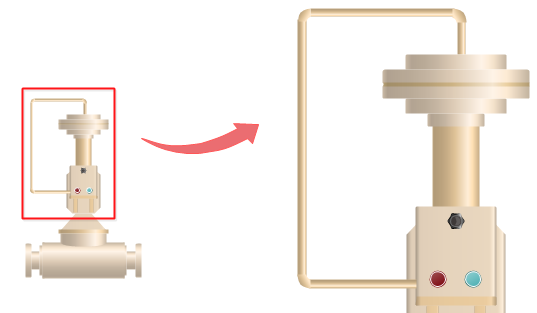 Vector valves symbols help you create high clarity P&IDs. 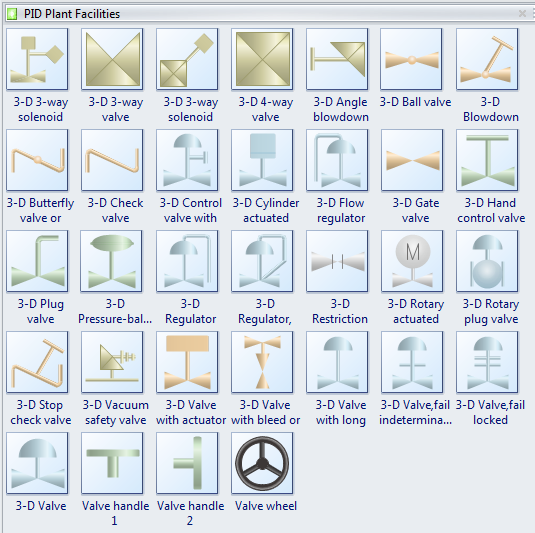 A wide range of pre-drawn P&ID valve symbols are included in Edraw. Fully editable, you can use these symbols to make professional and good looking piping and instrumentation diagrams. You can find comprehensive valve shapes with a variety of styles and functions, including ball valve, check valve horizontal, check valve vertical, control valve, control valve flange, control valve gray fit, etc. Ball valve is a form of quarter-turn valve which uses a hollow, perforated and pivoting ball to control flow through it. 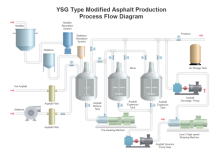 Check valve is a valve that normally allows fluid to flow through it in only one direction. 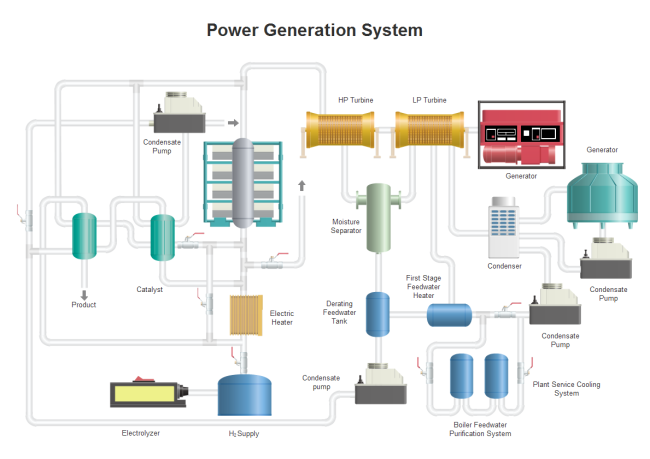 Motor valve is the valve with motor serving the purpose of fully opening or fully closing in pipelines. 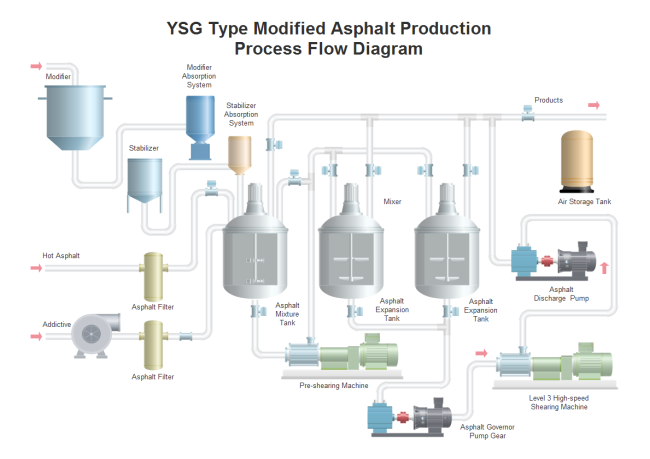 Control valve is used to control conditions by fully or partially opening or closing in response to signals received from controllers whose value is provided by sensors that monitor changes in such conditions. Pinch valve is full bore or fully ported type of control valve which uses a pinching effect to obstruct fluid flow. In this stencil, you will find a collection of 3D valve symbols, such as 3D 3-way-solenoid, 3D 3-way-valve, 3D ball valve, 3D butterfly valve, 3D control valve, etc. The symbols are in vector format, thus highly customizable. You can add own texts, resize or move shapes, and change the colors. You can scale the shape to any size without loss of the clarity. No blur image anymore. You can change the filling color to any color you like. To change the filling color for a part of a shape, first you need to select the sub shape. Click on the sub shape you want to change color for a few times until it is successfully selected (there will be a blue selection frame), then you can change this sub shape with a new color, and with other parts unchanged. Some samples are provided to illustrate how to use the symbols. 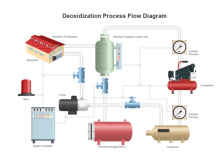 Everyone can make similar piping and instrument diagrams with no professional experience required.